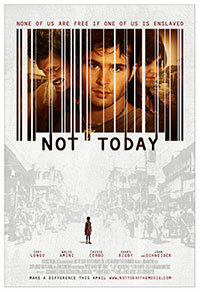 Roaming from California to India, Not Today weaves a moving, inspiring story of a young man’s (Hollywood Heights’ Cody Longo) journey from spoiled Orange County “adult-olescent” to a true believer in the fight against human trafficking, risking his life to help the helpless. Not Today is a powerful reminder that change is possible if we’re willing to open our eyes … today. With Walid Amini, Shari Rigby and John Schneider (The Dukes of Hazzard).